The Šumava mountains (Bohemian Forest) is a large mountain range along the southern Czech border between the Vyšebrodský Průsmyk (Vyšší Brod Defile) and Všerubský Průsmyk (Všeruby Defile). It lies between the small towns Vyšší Brod (near the Czech-Austian border in South Bohemia) and Všeruby (near the town Klatovy in West Bohemia). It is the spring area of the biggest Czech river Vltava and of the important South Bohemian river Otava (the tributary of the Vltava river). The Šumava mountains is about 120 km long and they lie on both sides of the border. The German part is called Bavarian Forest. The width of the mountain range is about 45 km. The highest peak of the mountains is Gross Arber - Velký Javor in the Czech language - (Big Maple - 1,457 m), which lies in Germany, not far from the town Železná Ruda. Plechý mountain (1,378 m) is the highest peak of the Czech part; it lies near the state boundary near the beginning of the Lipno Dam. The Šumava mountains comprise six geomorphological parts. 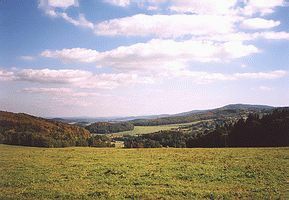 The largest one is the Šumavské Pláně (Šumava Plains) with a little rolling terrain. It is about 55 km long, at most 20 km wide and its area is about 670 square km. The Železnorudská Hornatina (Železná Ruda Highlands) is about 200 square km large and it is situated in the most western part of the Šumava mountains in the surroundings of Železná Ruda. The highest peak of this part is Jezerní Hora (Lake Mount - 1,343 m) above Černé Jezero (Black Lake). In the south-eastern part of the Šumava mountains there is the Trojmezenská Hornatina (Trojmezná Highlands) with the highest mountain of Šumava - Plechý. Its area is 360 square km. 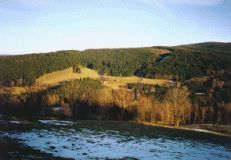 The wooded Boubínská Hornatina (Boubín Highlands) is the highest situated part of the Šumava mountains and it is sparsely inhabited. It is about 130 square km large and its highest peak is Boubín mountain (1,362 m). The neighbouring Želnavská Hornatina (Želnava Highlands) with Knížecí Stolec mountain (Princely Seat - 1,226 m) is about 180 square km large. 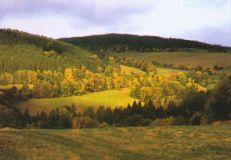 The natural boundary between the inland part and the border part of the Šumava is the so-called Vltavická Brázda (Vltava Valley, 136 square km) along the upper reaches of the Vltava river. It is about 2 - 4 km wide and about 45 km long open wide valley with many peat-bogs. The Šumava mountains are very well preserved, untouched and valuable area. The Protected Landscape Area and the National Park Šumava with many reserves were established for its protection and they cover virtually the whole mountain range.